This article highlights the futility of large-scale building on green belt land. 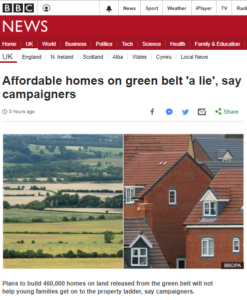 Building on the green belt primarily benefits house builders due to the ease of building on pristine land and local government who raise money from increased council tax revenues and hitting house-building targets. The people who need homes the most and need help to get on the housing ladder are priced out. It is obvious from this report and others that more effort needs to go into brown-field redevelopment and bringing empty buildings back in to use. Only one day after this article was published by the BBC, another article from the same source explains Liverpool Council’s motives for building despite objections from local residents. The city’s mayor is quoted as saying that, “…the homes planned for the site will bring in high council tax receipts…” and this seems to be their primary reason for overruling 90% of local residents.